Designed specifically for ultimate product protection of non-hazardous drugs. The Baker SterilSHIELD® Barrier Isolator offers a positive pressure work area for pharmacy applications. 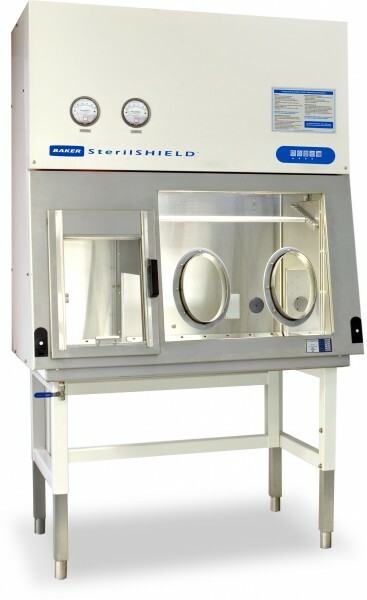 Designed specifically for aseptic compounding of non-hazardous drugs and to meet or exceed the requirements of USP , the SterilSHIELD® creates a HEPA-filtered unidirectional airflow of better than ISO Class 5 (Class 100) air cleanliness conditions within the direct compounding area to prevent contaminants from the outside entering the chambers. Our high performance systems and clean technology improve pharmaceutical compounding performance in the laboratory. As one of the most comfortable barrier isolators in the industry, the SterilSHIELD® features a slanted viewscreen with a top hinge that allows for full opening for loading and unloading of pharmacy instrumentation or equipment. Oval gloveports offer easy reach to interior surfaces for users of different heights, and multiple positions allow total access to the interior. There is also a spacious, positive pressure interchange (pass-thru chamber) allows clean and easy transfer of materials in or out of the chamber. An adjustable stand allows the cabinet to be configured for standing or seated operation.